Dividing backyard space into outdoor "rooms" is a growing trend in landscape and hardscape design with the biggest focus being on the outdoor kitchen. No longer just a barbeque counter or the lone charcoal grill, the outdoor kitchen is growing in size and functionality as it steals the spotlight and becomes a main focal point in the backyard. In this article, Scott Cohen, HGTV's favorite Garden Artisan, shares his insight on how to design today's trendy outdoor kitchens. Nowadays outdoor kitchens are a more elaborate extension of the indoor kitchen and far more sophisticated than a simple charcoal grill. Outdoor kitchens need to be sized appropriately for the space available while meeting the entertaining and dining needs of the homeowner. Outdoor kitchens are the hottest trend in backyard entertaining and can range in complexity from a simple gas grill flanked by concrete countertops to elaborate, fully equipped kitchens. Entertaining needs: These questions will help you size the counter. How many people do you entertain on a regular basis outdoors? Will you need to be able to accommodate a bartender and/or caterer? How large of a grill do you plan to use? 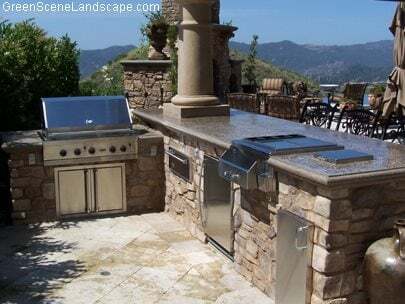 What outdoor kitchen accessories and appliances do you want to include in your layout? How many people do you want to be able to have at the bar counter? Is there an area in the yard that you think would perform best for the outdoor kitchen? From which direction does the prevailing wind come? What are the sun and shade angles in the yard ?